Here we go again this week for another fun way to start the weekend. What are you wearing is back in full swing for the fall! I have to say that I do love fall for the clothes. 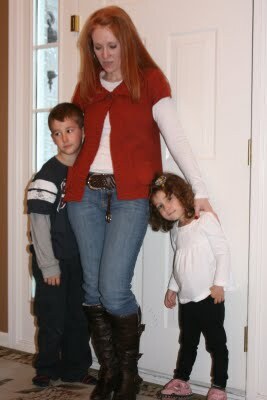 I love sweaters and layers and the boots, how I adore high boots! I have been wearing a pair (different) of knee high boots for the past two weeks. My husband thinks I'm absurd! It's cold here in the midwest . . . I have to wear a jacket everyday so I thought I would show what I look like outside and what I look like inside. This jacket is more of a spring jacket, well the color anyway. But I love it . . . Burberry . . . I have had it for about 6 years now. Hubbie bought it for me. 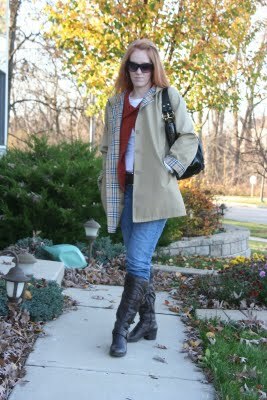 Nothing better than a Burberry trench coat! My pocketbook is a new one, well sort of, I purchased this as a birthday present to myself. I love it! I will likely carry this all the way through to spring. LV bag, everyone who reads this blog knows I have a serious addiction to fine handbags and this one is just that. I bought these boots seeing them online. I loved the look of the boots online and I still like the look of them on me. However, they are more narrow than I would normally purchase since I have some fat little feet. I also have a neuroma on my (left)foot that these boots are really aggravating. I will be going to the Dr next week for a cortisone injection that will hopefully alleviate this issue. Why does my hair looks so much redder indoors than outdoors? Can someone please explain this to me? I'm just wearing simple silver hoop earrings and bangles on my wrist. I also have on a jade bracelet that you can't see. And I seriously need to work on my thighs! I'm getting a bit thick there! WOW & OUCH! Really looking forward to some great weather this weekend. Likely the last of the season.